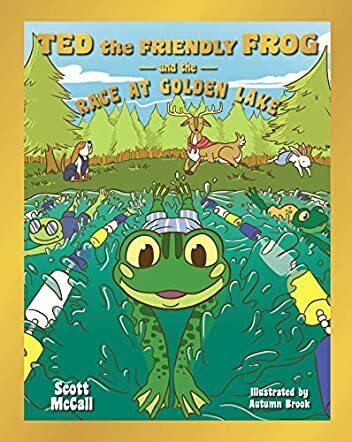 Ted the Friendly Frog and the Race at Golden Lake is an animal adventure picture book for children, grades K-3, written by Scott McCall and illustrated by Autumn Brook. The Golden Lake Frog Meet was a major event for frogs, and it attracted participants from all over the country. Ted was anxiously looking forward to this year’s event. He had placed 7th the year before and had spent hours practicing his form and strokes. He knew he could win it this time -- he’d be a champion! Since it was still very early, and the races wouldn’t start for a few hours, Ted decided to look for a tasty snack. He saw a tempting fly, but it flew off over his head. Entering the woods, he noticed a hive with bees buzzing around it, but still no tasty frog treats. Then he realized he was lost. How could he get back to Golden Lake in time? Luckily there were some friendly animals in the woods: new friends for Ted to get to know; friends who could help him get back to the meet. Ted the Friendly Frog and the Race at Golden Lake is a heartwarming fable about friendship and the choices one sometimes has to make such as helping a friend in need. Ted’s adventures in the woods are grand fun to watch, and his rescue by the white bunny, Winter, is portrayed brilliantly by Autumn Brook’s eloquent and colorful panel. McCall conveys the excitement of the actual meet, and the split-second decision Ted must make moments before he reaches the finish line. Brook’s illustrations are fabulous, rich in greens (of course!) and other bright and cheerful colors. McCall’s tale is a great selection for story time. It’s also perfectly suited for beginner readers to try on their own. Oh, and don’t forget to look at Ted’s helpful pictures showing the swimming strokes he uses. You don’t even have to be in the water to try them for the first time. Swimming is fun and healthy too! Ted the Friendly Frog and the Race at Golden Lake is most highly recommended.